Thursday, Mar. 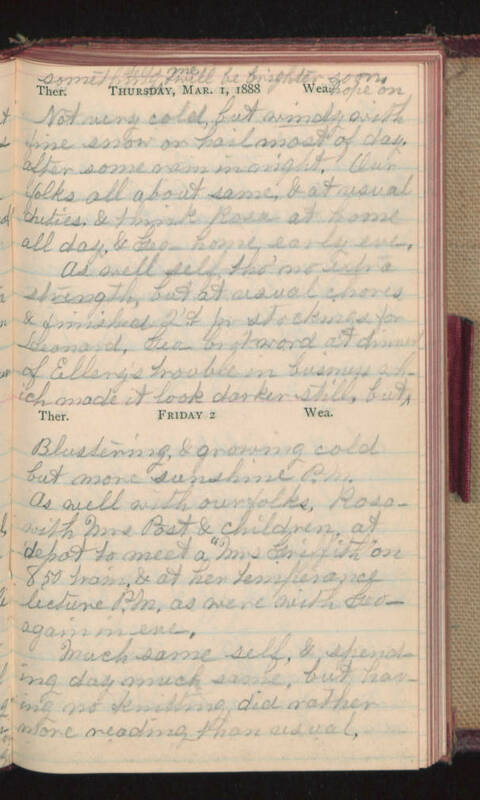 1, 1888 [upper margin - something tells me will be brighter soon hope on] Not very cold, but windy with fine snow or hail most of day. After some rain in night. Our folks all about same, & at usual duties. & think Rosa at home all day, & Geo home early eve. As well self, tho' no up a strength, but at usual chores & finished 2d pr stockings for Leonard, Geo bro't word at dinner of Ellery's trouble in business which made it look darker still, but^ Friday 2 Blustering, & growing cold but more sunshine P.M. As well with our folks, Rosa with Mrs Post & children at depot to meet a "Mrs Griffith" on 8.50 train, & at her temperance lecture P.M. as were with Geo again in eve. Much same self, & spending day much same, but having no knitting did rather more reading than usual.